Line your cake/tart tin with enough baking paper to cover the sides. Blitz base ingredients (macadamia nuts, dates and salt) in a food processor until the mixture is nice and sticky. Press mixture in to the bottom of prepared tin. Use your fingers to flatten it and spread it out around the tin nice and evenly. (If you can get it up around the sides as well then it is a bonus. My tin was too big). Place tin in freezer while preparing filling so the base hardens. Soak cashews in water for 10-15 minutes to soften up and then dab dry with a paper towel so no water is left on them. Put in the food processor along with coconut cream, lime juice and maple syrup (zest your lime first and put aside before squeezing out the juice). Blitz until mixture is combined and cashews are have no chunky bits. Pour filling over base and put back in to the freezer to set while making the topping. Put blueberries and dates in processor and pulse until combined. The sauce will be a little chunky from the blueberry skin but it doesn’t affect the overall texture. 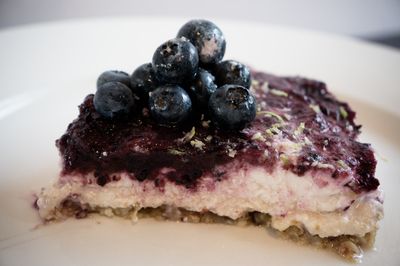 When the filling has hardened up, pour the blueberry sauce over the top and even out with a spatula. 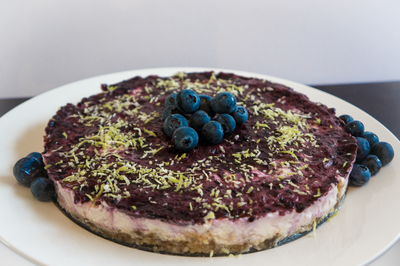 Place cheesecake in the fridge to set for at least 4 hours or overnight if you can so that it has time to set properly. 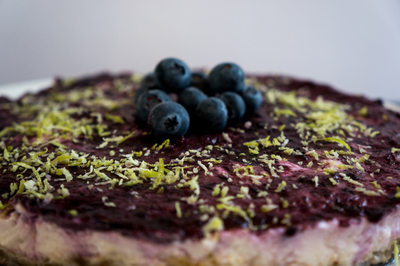 When ready to serve, decorate with fresh blueberries and lime zest!